Tamara Knott displays her kale growing in towers suspended on hooks. Tamara Knott has found a way around the sky-high real estate prices that are a barrier to many would-be farmers on southern Vancouver Island by growing fresh lettuce, kale and herbs in a closed shipping container. Knott runs Bright Greens Farm, which sells its produce to local residents and businesses on the Saanich Peninsula. She uses a shipping container farm built by Freight Farms. 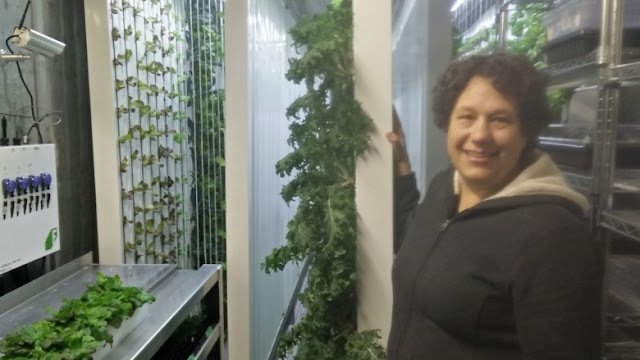 Freight Farms advertises their Leafy Green Machines for $82,000 US, although Knott said she purchased a demonstration model at a discounted price. She is able to produce the equivalent of about and acre and a half of soil based production.